What he neglects to divulge is the identity of said character. So now we’re left to speculate and wonder about which of the myriad Marvel characters is Gunn’s personal fave. This doesn’t even mean the character, whoever it is, will have a big role in the film, it could be that we see someone walk across the frame in the background or something of that nature. We certainly didn’t expect to see Howard the Duck show up in Guardians of the Galaxy, so who the hell knows how deep Gunn will go. There are also a ton of potential characters that Marvel doesn’t own the movie rights to that they can’t use. Later on in the Q&A session, someone asked if there was one in particular he wished he could use, but can’t, and he replied that he’d like to play around with ROM Spaceknight, a character whose rights reverted from Marvel back to Parker Brothers, who acquired the rights from the creator, back in 1986. Gunn has also said that Guardians 2 will feature more prominent female roles, so there has been speculation that any number of women from the MCU could show up. However it goes down, we probably won’t find out for more than two years. Who do you hope it is? Who do you want to see in Guardians of the Galaxy 2? It is Bug. He has repeatedly said that is his favorite character, so 9/10 chance it will be Bug. 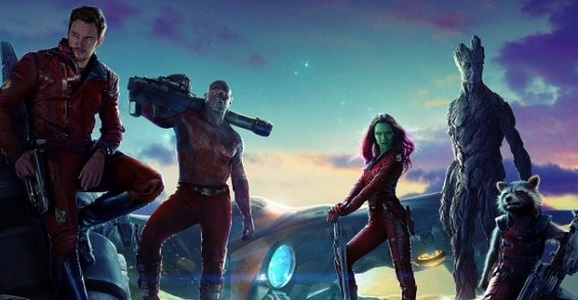 Bug was also cut from an early script for GotG 1, so it makes sense that Gunn would be allowed to bring in what he wants now that GotG 1 was proved to be a great success. About a week ago some site was saying that a tweet not long before this one had him saying that Iron Man 1 is his all time favorite super hero film and thus demised that Iron Man will show up, as was supposedly supposed to happens in the first GotG. According to them at that point It was looking like RDJ was going to be gone at that point and that’s why that got scratched but that now supposedly he’s been quoted as wanting to continue to do Iron Man but in a more diminished role; what they took to mean cameos a la Nick Fury in the future non Avengers films.